Josh Scowen scored his fifth goal of the season. 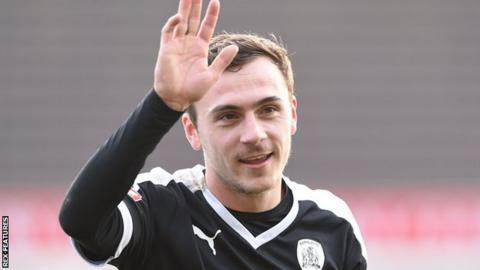 Barnsley climbed back into the play-off places as two second-half goals gave them victory at Fleetwood. Tykes goalkeeper Adam Davies twice prevented Thomas Grant putting the home side ahead in the opening half. And Barnsley took the lead when Joe Davis headed the ball into his own net after Sam Winnall pressured the centre-back into a misunderstanding with Fleetwood goalkeeper Chris Maxwell. Josh Scowen nodded Adam Hammill's corner home to make sure of the points. Match ends, Fleetwood Town 0, Barnsley 2. Second Half ends, Fleetwood Town 0, Barnsley 2. Substitution, Barnsley. Harry Chapman replaces Lloyd Isgrove. Josh Scowen (Barnsley) wins a free kick in the defensive half. Josh Scowen (Barnsley) is shown the yellow card for a bad foul. Jimmy Ryan (Fleetwood Town) wins a free kick in the attacking half. Foul by Josh Scowen (Barnsley). Corner, Fleetwood Town. Conceded by Josh Brownhill. Goal! Fleetwood Town 0, Barnsley 2. Josh Scowen (Barnsley) header from very close range to the bottom left corner. Assisted by Conor Hourihane. Corner, Barnsley. Conceded by Marcus Nilsson. Foul by Joe Davis (Fleetwood Town). Stefan Scougall (Fleetwood Town) wins a free kick on the right wing. Foul by Josh Brownhill (Barnsley). Stefan Scougall (Fleetwood Town) wins a free kick in the attacking half. Corner, Barnsley. Conceded by Conor McLaughlin. Corner, Barnsley. Conceded by Jimmy Ryan. Corner, Barnsley. Conceded by Joe Davis. Substitution, Barnsley. Josh Scowen replaces Ashley Fletcher. Substitution, Fleetwood Town. Stefan Scougall replaces Eggert Jónsson. Marc Roberts (Barnsley) wins a free kick in the attacking half. Attempt saved. Antoni Sarcevic (Fleetwood Town) header from the centre of the box is saved in the centre of the goal. Thomas Grant (Fleetwood Town) wins a free kick in the attacking half. Substitution, Fleetwood Town. Antoni Sarcevic replaces David Ball. Attempt missed. Amari'i Bell (Fleetwood Town) left footed shot from the left side of the box is close, but misses to the left. Attempt saved. Joe Davis (Fleetwood Town) right footed shot from the left side of the six yard box is saved in the top centre of the goal.